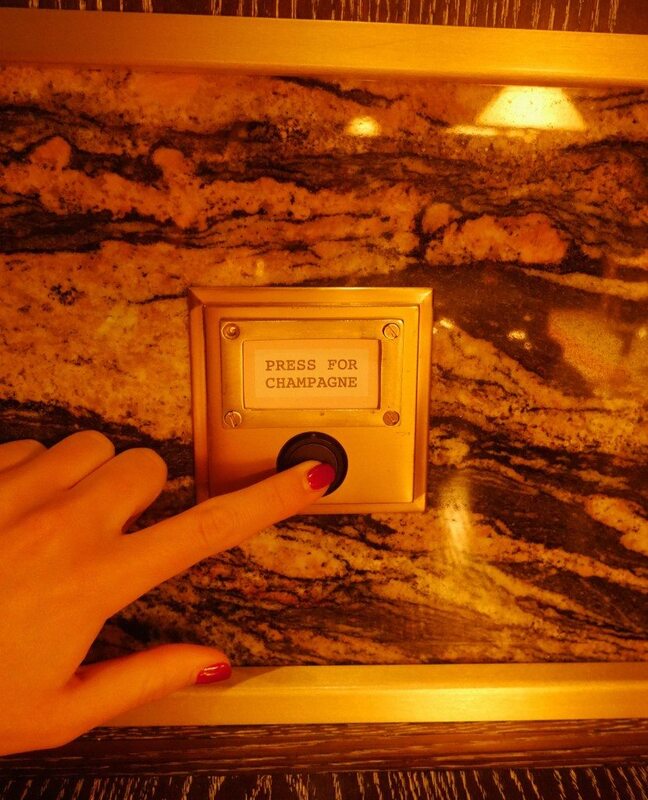 I have tried to book a table at Bob Bob Ricard many-a-time since first hearing about the infamous ‘Press for Champagne’ button positioned at every table. Yes, EVERY table. 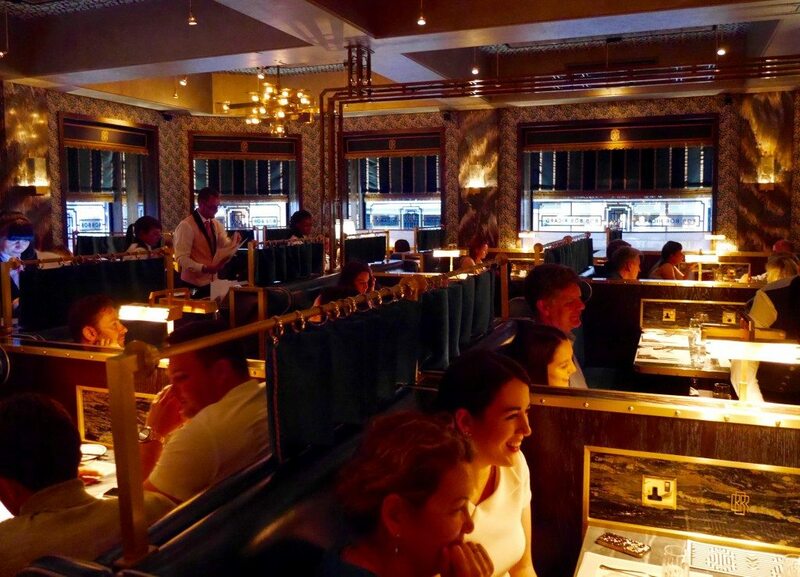 But, funnily enough, most people (/women) appeared to have the same brilliant idea, which meant that tables were only ever available at most inconvenient dining times, despite trying to book months in advance. 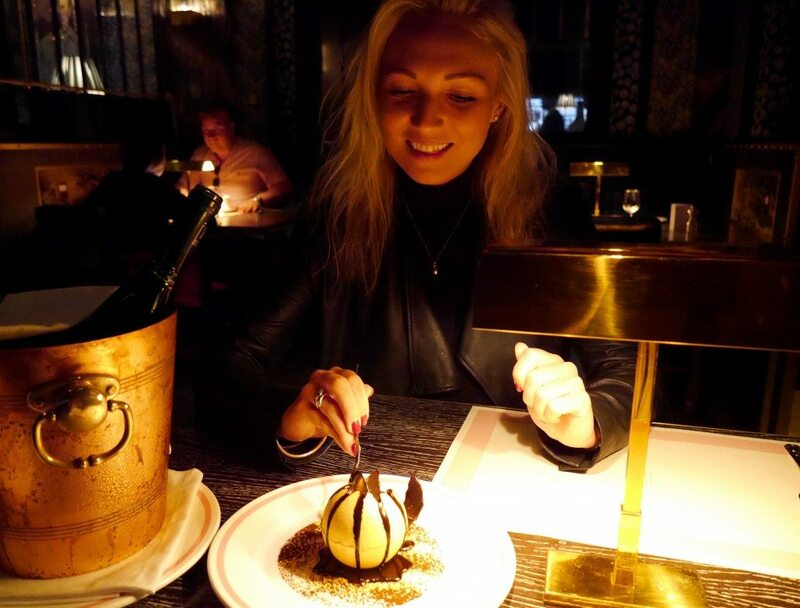 Enter Lauren Hudson, an absolute gem of a person & blogger, who managed to snag us a table at 6pm last Saturday. My elation at finally visiting the venue that pours more champagne than any other restaurant in the UK, and at last meeting this lovely lass, knew no bounds! Service: The service is incredibly swanky. A doorman (who could easily pass for a bouncer (Russki’s, eh?)) is on guard to welcome you through the heavy front doors, where you are immediately met by both a greeter and another person managing the front desk. Between the two of them, someone is instructed to show you to your seats, and all the stops are pulled out with pulling out & pushing in your chair for you. To be perfectly honest, I hadn’t expected either the restaurant or the service to be quite as smart as it was. But they were perfectly in sync and on point, so I chose to revel in every moment. Once seated, the Restaurant Manager, Raitis Logins, paid us a visit, offered us drinks & menus. The drinks appeared almost by magic and, before long, Raitis returned to take our orders and ask if we had any questions about the menu, which I did, to which he took the time to personalize his recommendations based on our food preferences, and describe the various components of certain dishes, plus the origins of their ingredients. This kind of blew me away, as not only was it exceptional service, but he engaged with us as actual people and built up a good rapport, to the extent that I genuinely felt that we would be comfortably taken care of for the rest of the evening, which is always a nice (and, sadly, very unusual) feeling to have when eating out. I’d like to think that this is custom of Bob Bob Ricard, but I should say that it may have been unique due to the fact that the restaurant was still relatively empty at this point. Of course, we couldn’t resist pressing the notorious button for long. And, as promised, seconds after we did, a waiter appeared to ask which champagne we would like. We ordered two glasses of ’Ayala Brut Majeur Champagne, NV’ (£13.50 each) to kick off the evening in style. Throughout our meal, service was excellent; glasses were constantly re-filled (bordering on too much so for me, but at least they never ran dry! ); a suitable amount of time was allowed between courses; we were not at all rushed, despite overstaying our time limit; and I was presented with a complimentary miniature birthday cake (to celebrate my birthday, a week in advance, of course). I did, however, have two minor gripes, which I shall breeze over very quickly, in light of everything else. The first being that the restaurant was still pretty empty when we left at 8:30pm, and on our way out we passed some walk-in’s who managed to get a table straight away; had we known that this would be the case, we would, of course, have opted for a table slightly later than 6pm. But with Roka (my favourite restaurant – you can read my review here) just around the corner, and my shochu jar on tap, this was forgiven & forgotten rather quickly. 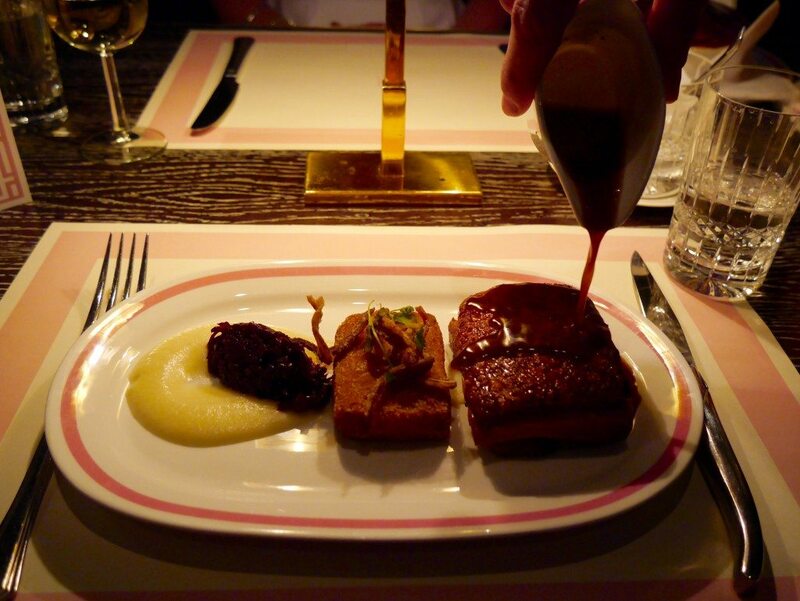 And the second being that I requested extra sauce for my pork belly main (classic me – there will never be enough), which arrived no problem, but was added to the bill at a cost of £2. Given the standing of the restaurant, our total bill, the fact that I wasn’t informed of the extra charge, and the measly (half-filled) jugs of sauce that were served on both rounds, I felt that this was rather stingy & poor form of Bob Bob Ricard, from a principle versus price perspective (do you agree, or am I on my own with this one?). However, I raised this tiny irritation (in a very friendly manner) with Raitis when he came to collect payment, and he quite literally scrunched up the bill and threw it over his shoulder, returning momentarily with a revised bill and an apology, and agreed with me that Bob Bob Ricard should not charge for such things, erasing the minute issue entirely. 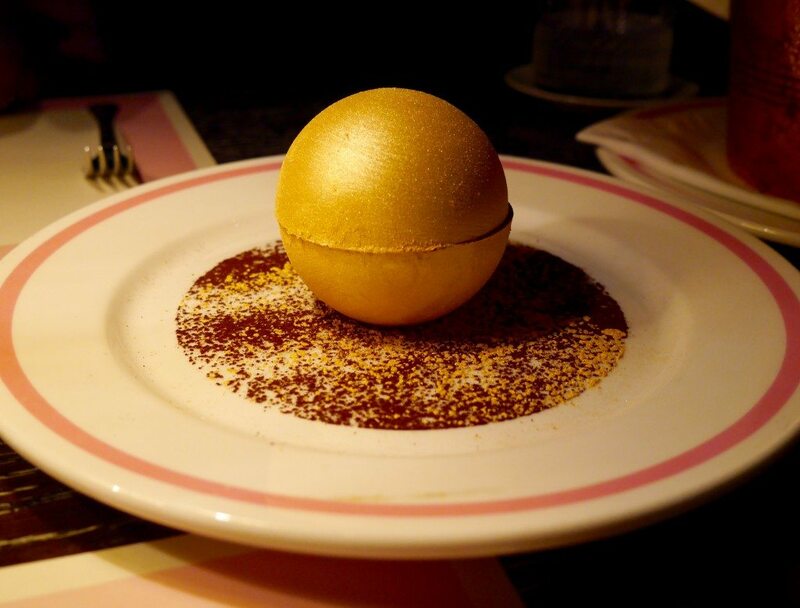 Ambience: Everything about Bob Bob Ricard screams luxury. The stunning and truly unique dining room is modelled on the Orient Express, transporting you to another world of pure glitz & glory. 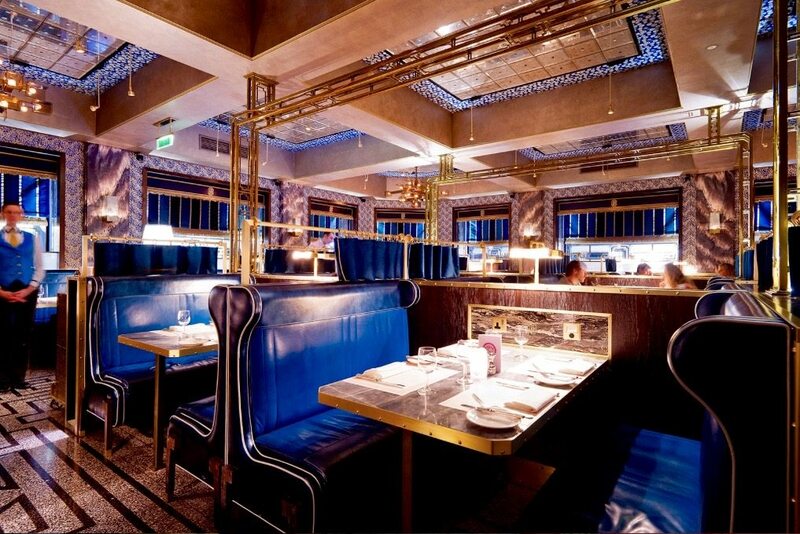 The restaurant has a glamourous all-booth dining room, made from plush blue leather. I could happily, and very easily, while away a few hours at the beautiful bar. No expense has been spared with marble, gold and grand art deco slapping you in the face every which way you look. Effort has gone into every detail. Even the glassware has been beautifully cut with BBR’s design. And let’s not be forgetting the piece de resistance. 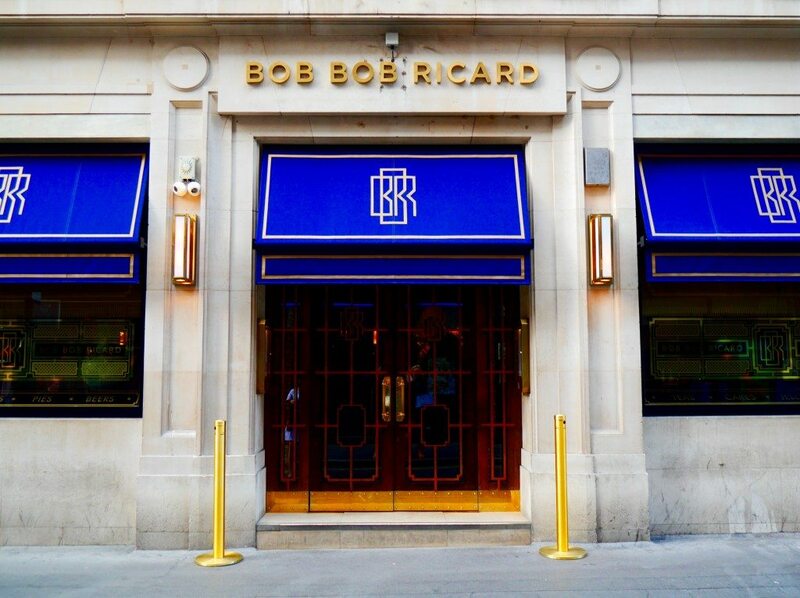 Food: Bob Bob Ricard’s menu maintains the air of luxury, offering lavish English & Russian dishes, with caviar, foie gras, truffles, lobster and beef wellington all featured. 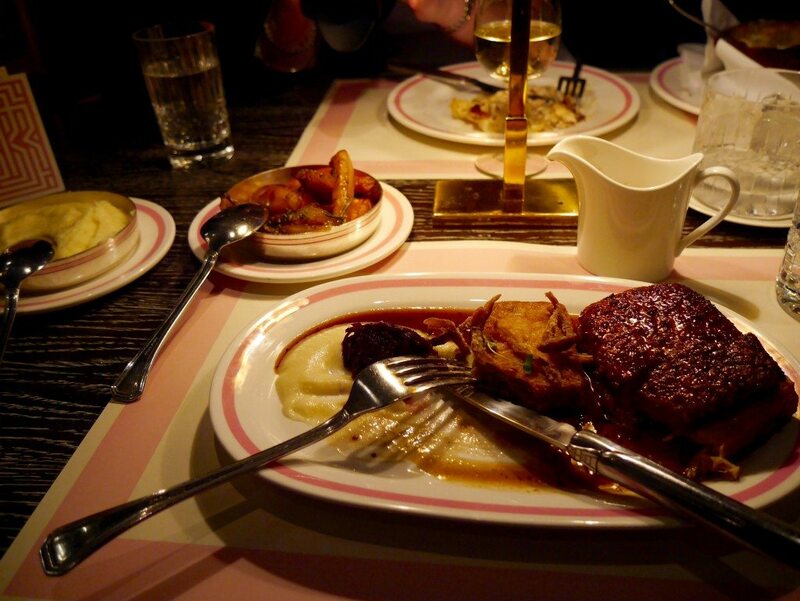 In other words, it’s a menu of pure gluttony, at its very, very best. With so many outrageously appetizing options, we needed some wine, ‘Picpoul de Pinet, Chateau de la Mirande, Languedoc, 2014’ (£29.00), to help us think straight (excellent logic, I know). To start, both Lauren and I chose refreshing, light & fishy starters. 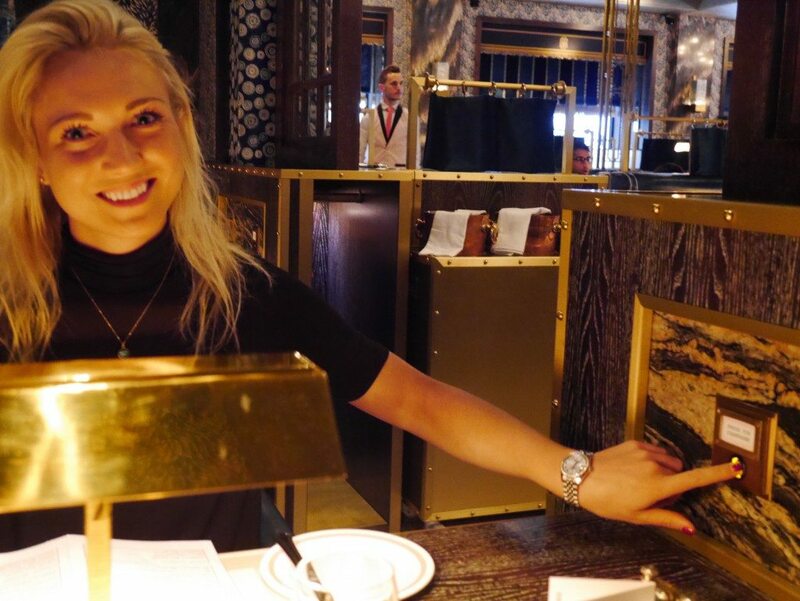 I had the crab salad with chili avocado mayonnaise, served with cherry tomatoes and herb crostini (£12.50), whilst Lauren had the salmon tartare garnished with cucumber, fennel and horseradish (£8.50). Both were delicious and incredibly fresh. 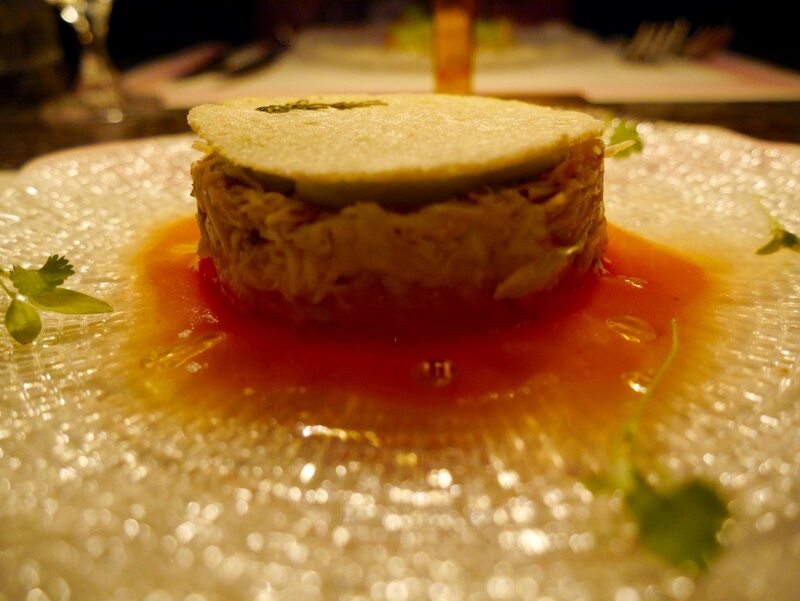 My crab meat itself was so juicy and flavoursome, with the avocado adding delightful creaminess and the slightly crisp crostini providing just the right amount of texture. 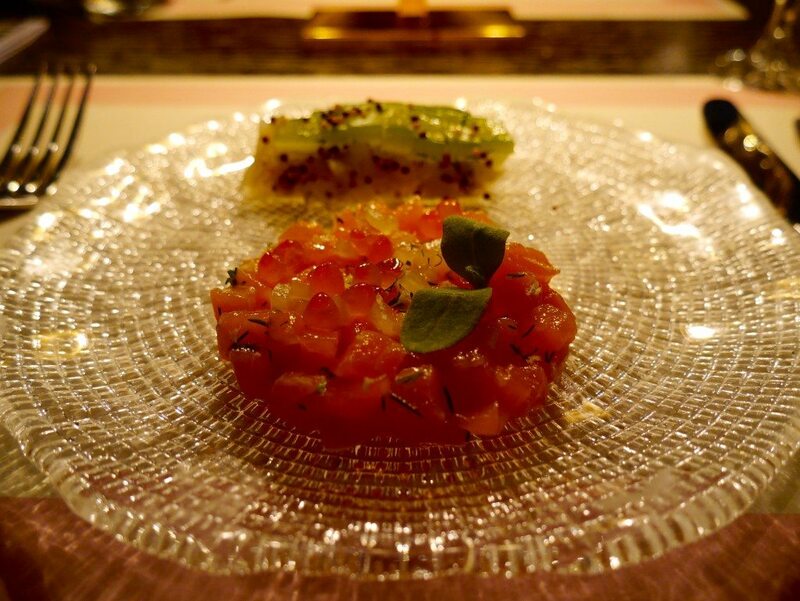 Lauren’s salmon tartare was of the highest quality, with the fatty salmon melting like butter on the tongue. Although an excellent dish, it was perhaps a little one dimensional for me, however, thankfully Lauren thoroughly enjoyed it! 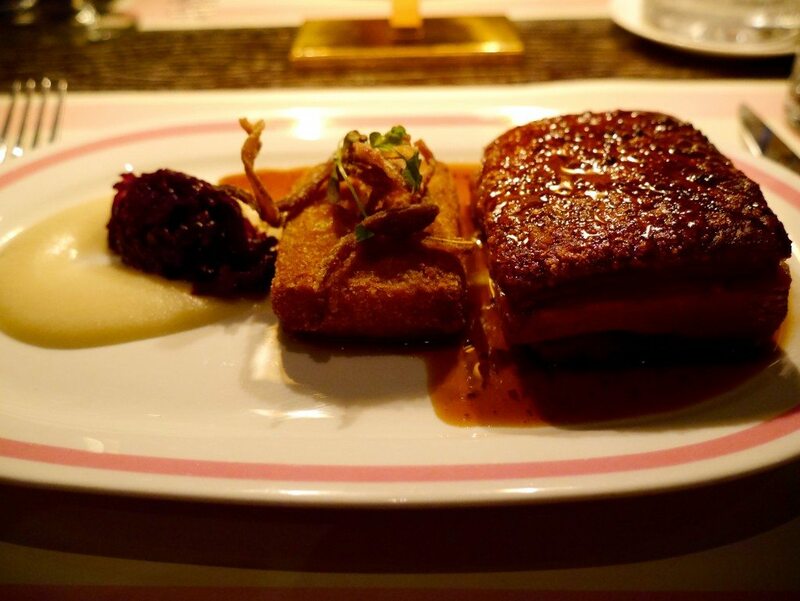 For mains, I ordered the crispy pork belly on red cabbage and apple puree, served with truffle gravy (£22.50). I have no words. The dish was outstanding, and the portion of pork incredibly generous for the price. 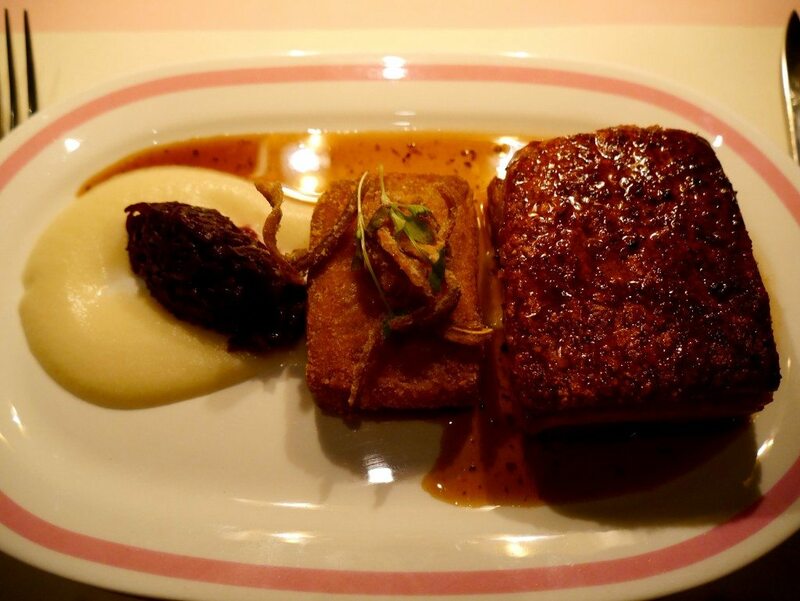 Both pork components of my main were cooked to utter perfection, although it was lacking slightly in accompaniments. But fear not, as that is what the sides are for! 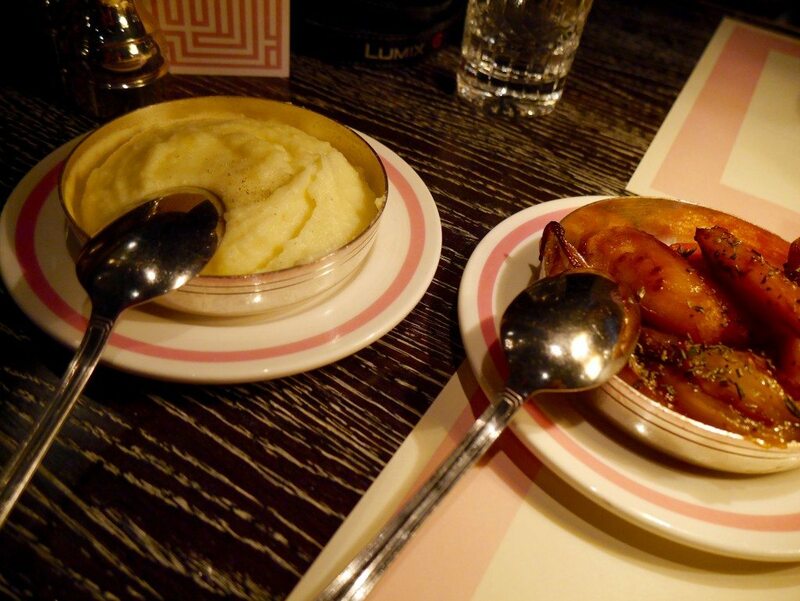 I ordered the mashed potatoes (£4.95), and shared the carrots & parsnips in beef dripping with honey & thyme (£5.50) with Lauren. While both were entirely on point, I must admit that I am obsessed with red cabbage, and I would have preferred a bucket of the stuff rather than the meagre teaspoonful provided on my plate (or to at least have had the option to order some more). The mashed potatoes were buttery smooth, but not overly rich, which was appreciated considering my substantively heavy dish. 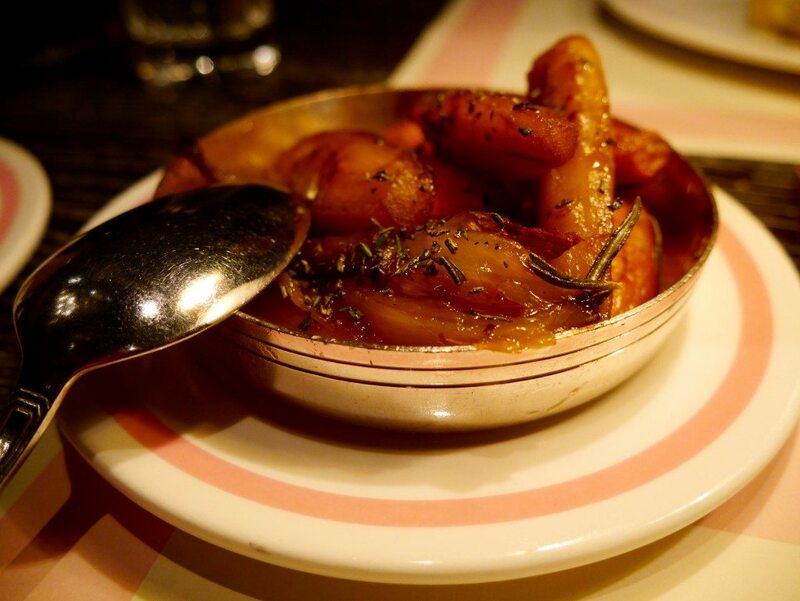 The carrots & parsnips were divine. Cooked al dente (as they always should be), with delicious flavour from the beef dripping & seasoning. Lauren went for the chicken, mushroom & champagne pie (£17.50), which was also excellent. Again, a beautifully presented hearty portion of tender & moist (sorry to all the haters, but it was moist!) 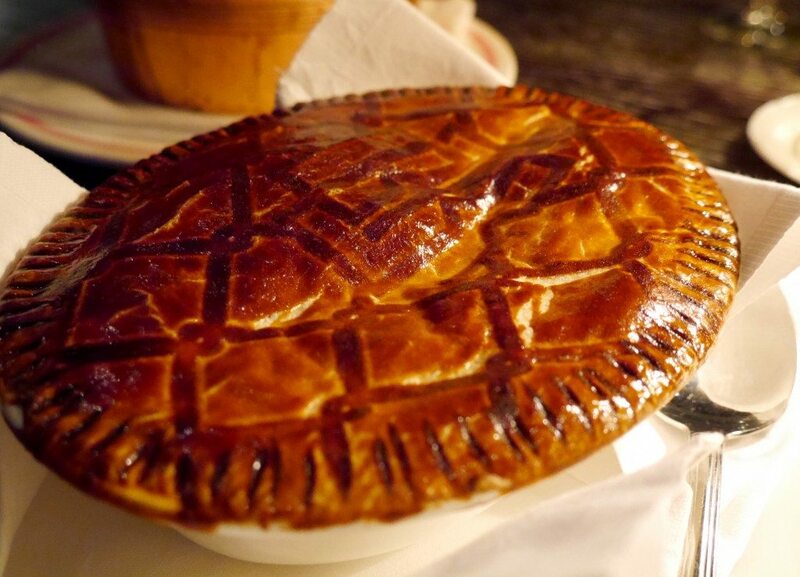 chicken; chewy (in the best way) mushrooms; and creamy, moreish sauce, topped with a perfect flakey pastry lid proudly emblazoned with ‘BBR’. With a little help from me (thank you Lauren! ), not a speck of food was left on either of our plates. 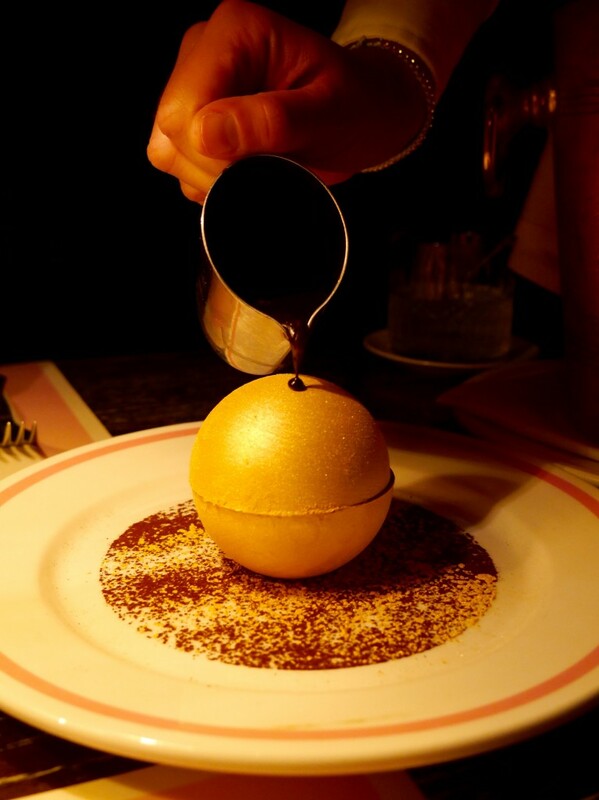 Then came the moment we had been waiting for – dessert. Having established that I was a ‘Joey’ (from Friends) with desserts (Lauren’s turn of phrase, which, after some clarification, I fell in love with, and will most definitely be stealing for future use! 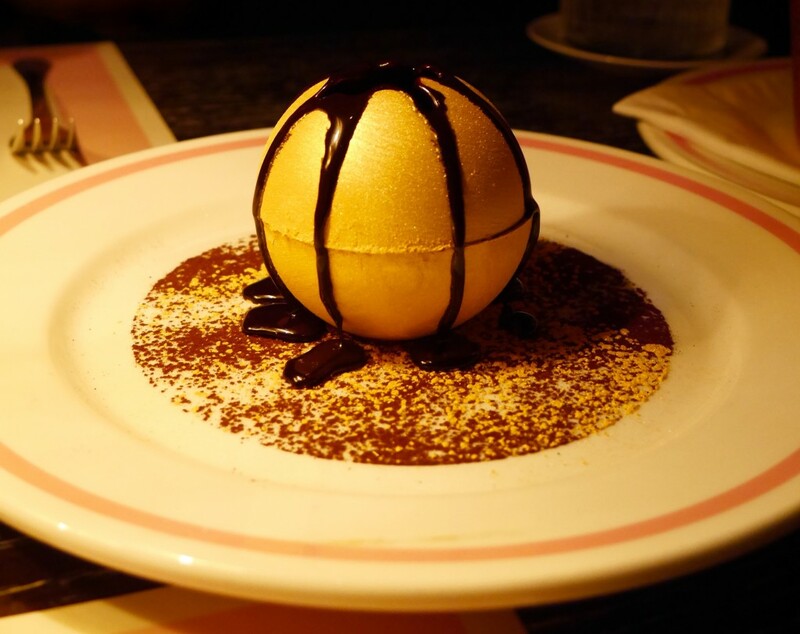 ), we quickly agreed that two desserts would be needed. 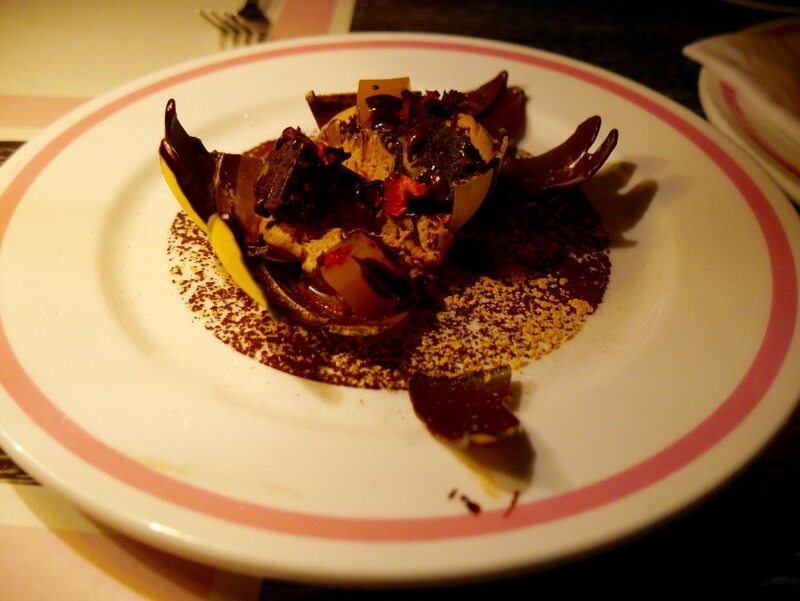 One of which didn’t even require us to look at the menu… of course we had to try BBR’s signature chocolate glory, consisting of chocolate jivara mousse, chocolate brownie, berries and passionfruit & orange jelly (£12.50). 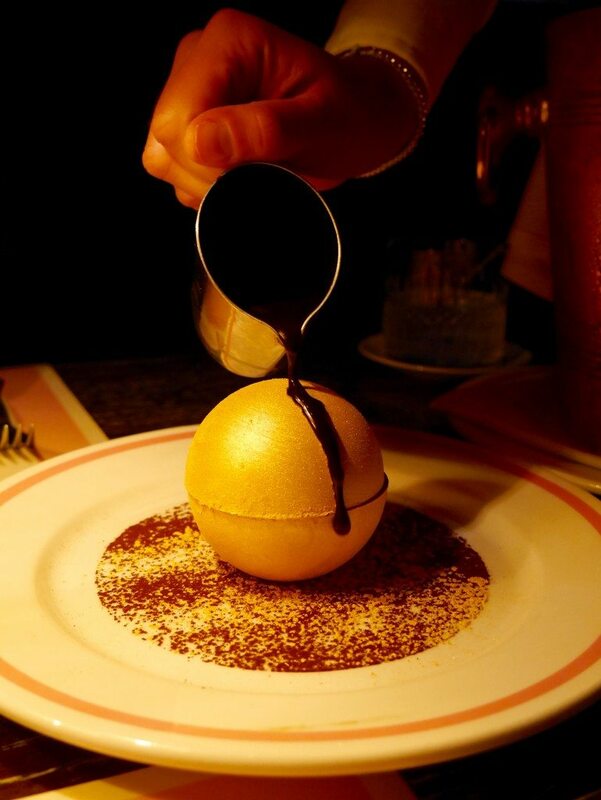 After admiring the perfect golden globe for a few moments, the chocolate sauce began to pour down and melt the beauty away. Lauren was kind enough to let me do the honours and break down the last of the golden walls. Revealing the Crown Jewels within. We wasted no time getting stuck in. And after all that build-up, I must admit that I was more than a little disappointed. With such a promising, rich description, I had gleefully expected to experience chocolate ecstasy and ride on a sugar high for the rest of the evening, but the dessert was surprisingly light, and the jewels a little thin on the ground. I was also not a fan of the passionfruit & orange jelly, which I found to be very fake tasting and out of place alongside the fresh berries. However, the kind gesture faltered as soon as we had a taste; the cake was dreadful. So bad, in fact, that we didn’t eat it. Now, I don’t know if you’ve realized yet, but I will pretty much eat anything, especially if it’s sweet, and especially if it’s free. So that is really saying something. It was an ice-cream cake littered with hundreds & thousands and other cheap, nasty, fake tasting things. 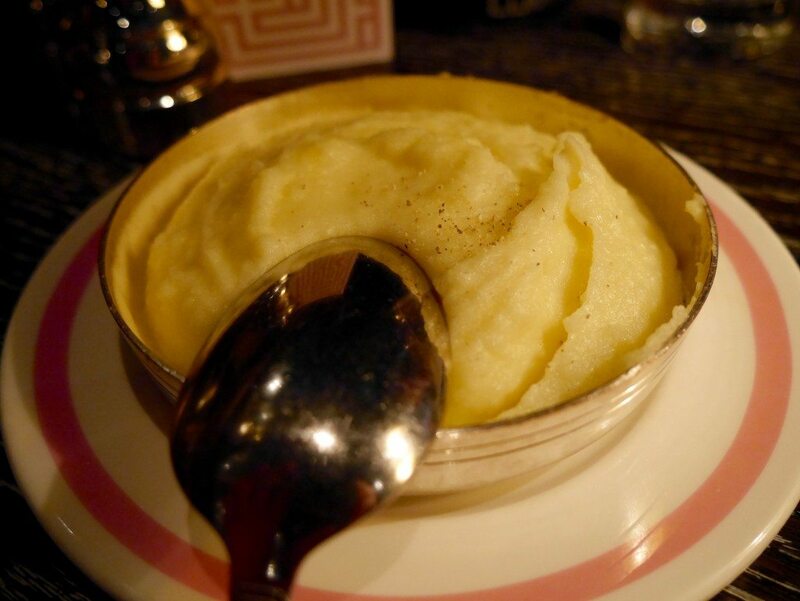 My advice to Bob Bob Ricard would be to stop serving this immediately – free or not – it was simply nowhere near a standard in-keeping with the rest of the food. Hence our second dessert had not been had after all. 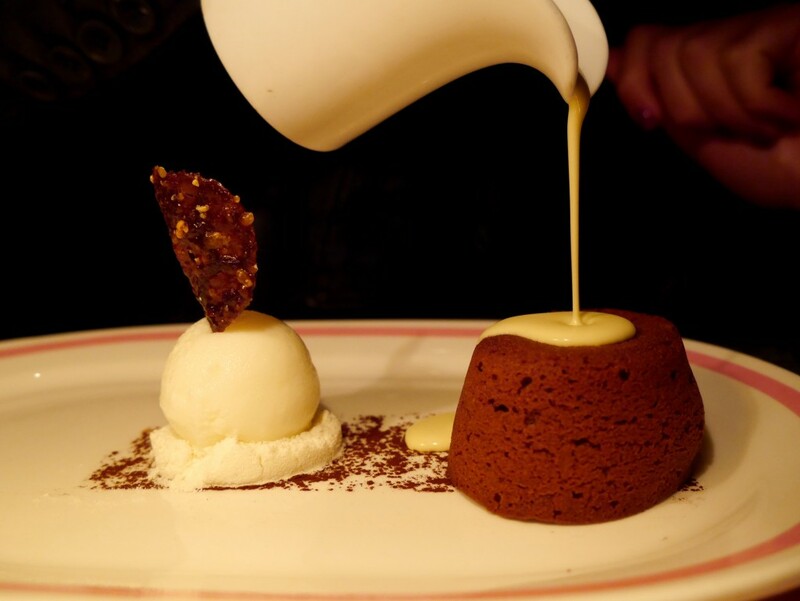 It didn’t take long before I was back perusing the menu, and it took even less time for me to spot the winner; chocolate fondant served with milk ice-cream, chocolate almond brandy snap and mint crème anglaise (£8.50). 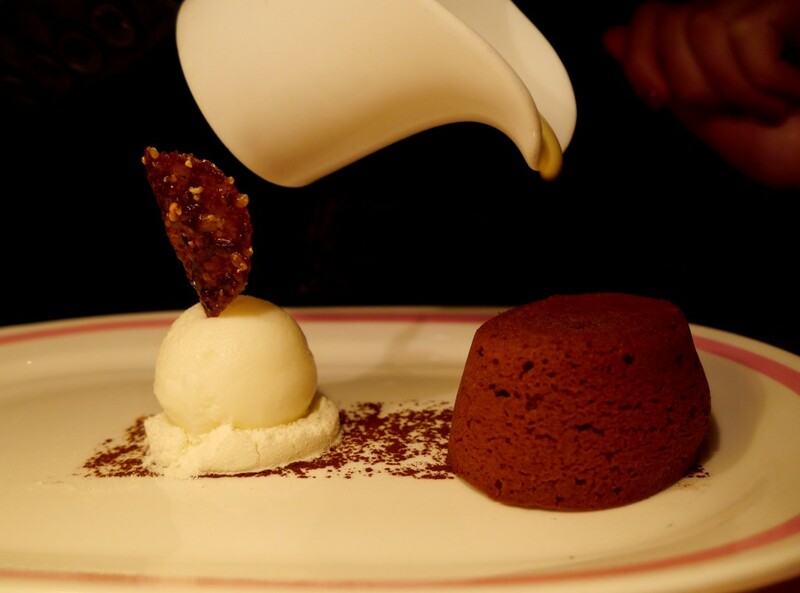 It looked pretty as a picture on the plate and, although the fondant was slightly smaller than I would have liked (what can I say, I’m a greedy gal), I was looking forward to getting my chocolate fix, at long last. 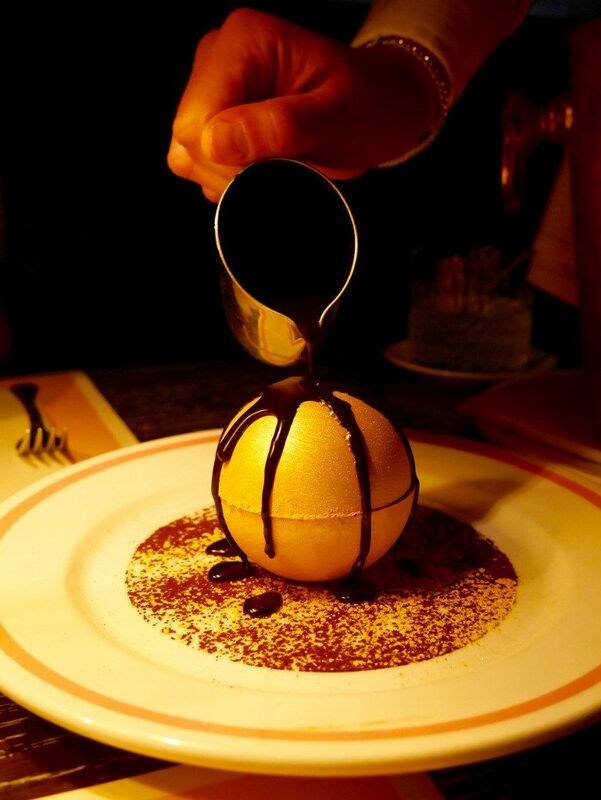 The mysterious hand arrived once more to pour the mint crème anglaise, and we were a-go. 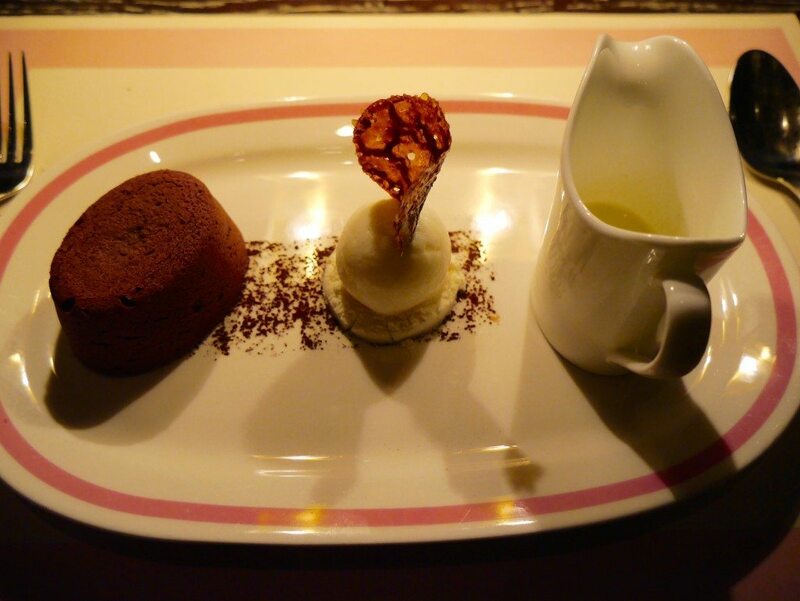 The chocolate fondant itself was very good, with a sponge-y outer and gooey inner, but the milk ice-cream was, as per usual (in my opinion), most unexciting, and should be replaced with vanilla (as previously stated in my review of 8 Hoxton Square). As for the mint crème anglaise, whoever imagined that toothpaste and custard would be a tasty combination should be put in prison – it was truly ghastly. That aside, the plate was polished. To end such a special evening and cleanse my mouth of any Sensodyne remnants, it seemed only fitting that we press the button just.one..more…time! 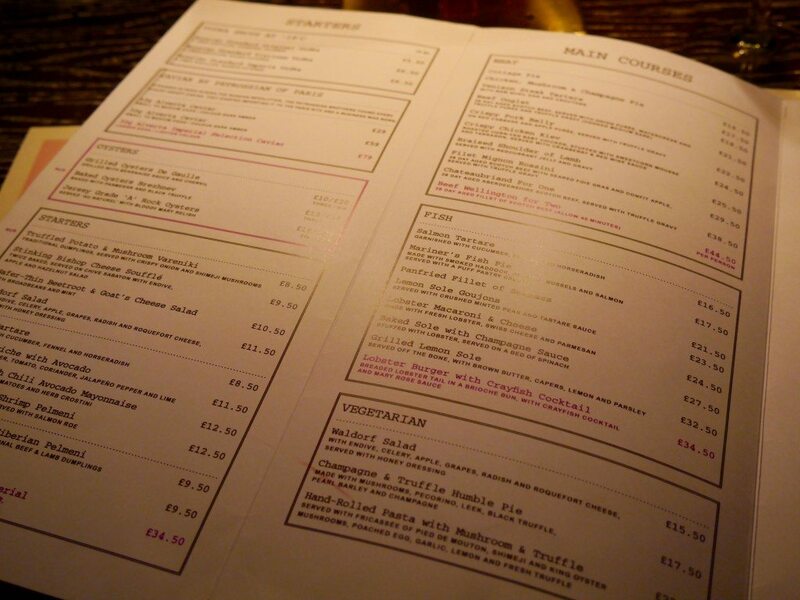 We had two glasses of ‘Prosecco CeV, Frassinelli, NV’ (£9.50), nattered on & on, and eventually requested the bill. 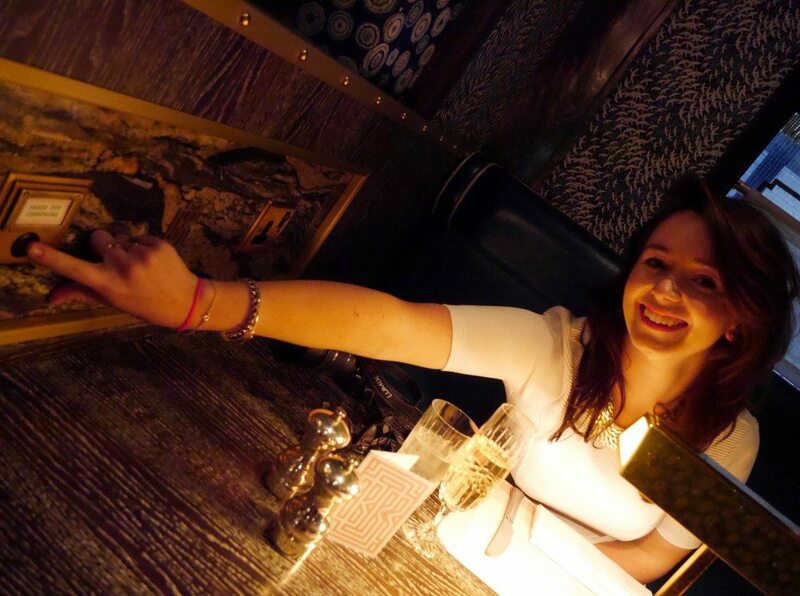 Price: The total bill was £188.38 with service, for a 3-course meal, 2 glasses of bubbly, and half a bottle of wine each. 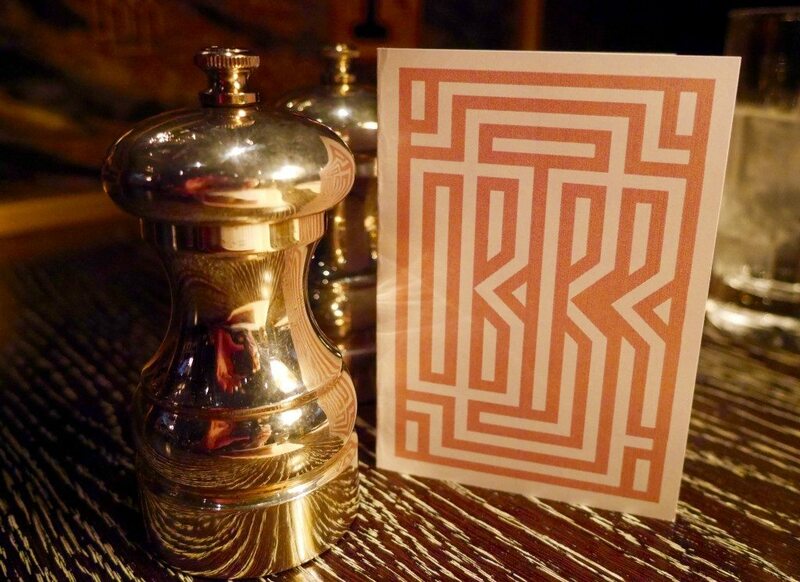 Yes, the prices at Bob Bob Ricard are at the upper end of the scale, but, hand on heart, they are worth it – the décor, service, quality & size of the (savoury!) dishes are all spot on. Next time I will simply be saving myself for dessert elsewhere! OMG I loved reading this, so lovely that you two met. 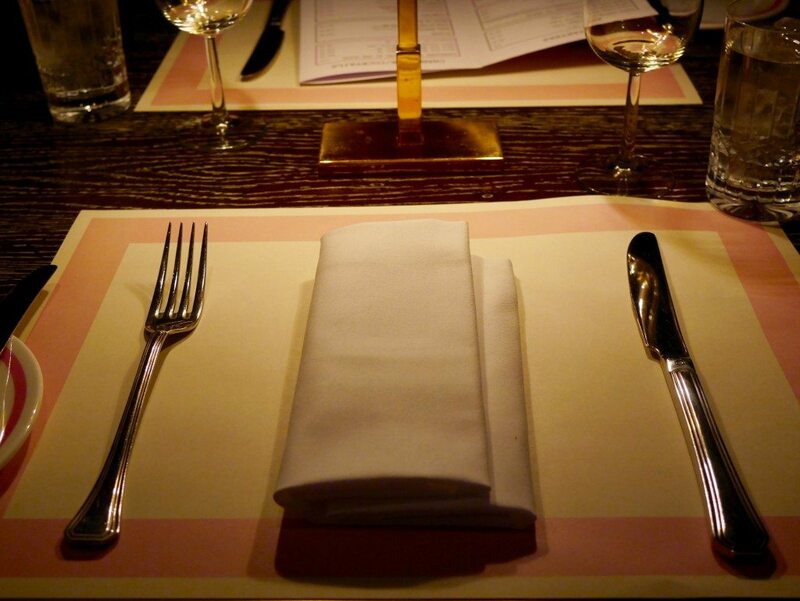 I loved this restaurant so much, it was definitely one of my favourite of the year so far! LOVE this!! You’ve literally made me want to try it out so badly so I am definitely going to book it once I’m back in London ? 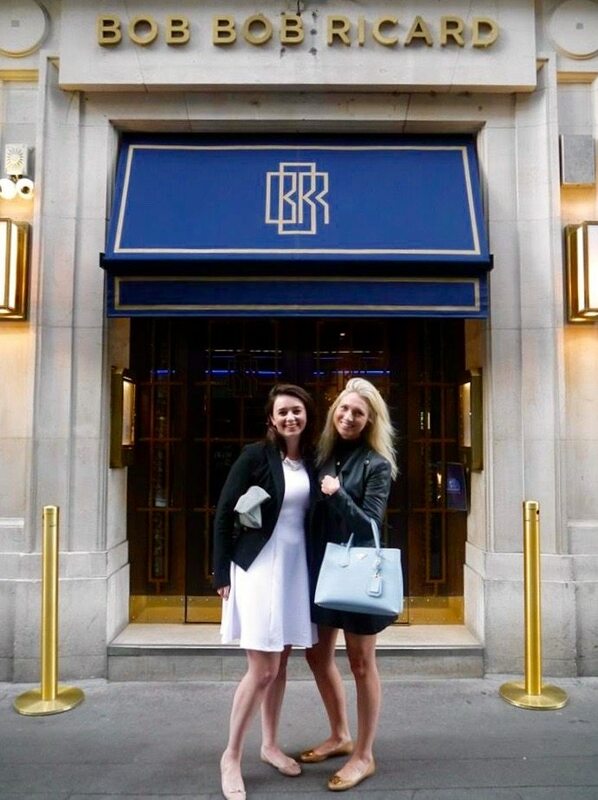 So happy you and Lauren had such a lovely time too! I love Bob Bob Richard. The interior really reminds me of The Great Gatsby! What a night eh?! So great to finally meet you over some excellent food and a good ol’ gossip! See you again very soon lovely! 1) You both look lovely! 2) Service is really top class, non? 3) This reminds me when Aftab and I went and his birthday cake tasted so much nicer than the signature dessert!